With the exception of Turkey, economic prospects across Eastern Europe are improving as domestic consumption picks up with help from tight labour markets, loose monetary policy and fiscal stimulus. Despite the positive outlook, more Eastern European respondents expect an overall deterioration than an improvement in the payment behaviour of their B2B customers over the coming 12 months. 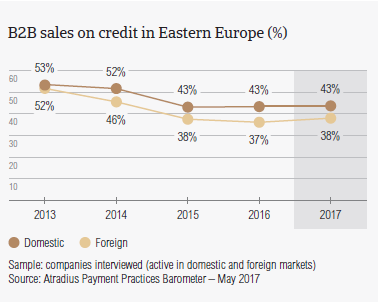 Despite a very modest increase in sales on credit terms this year (40.3%, up from 39.8% in 2016), respondents in Eastern Europe still seem to prefer selling on terms other than credit (59.7%). Similarly to what was observed in previous surveys, the average percentage of sales made on credit to domestic B2B customers (42.7%) is higher than the percentage of sales made on credit to foreign B2B customers (37.9%). With the exception of Hungary, Czech Republic and Slovakia, all Eastern European countries surveyed seem to be more averse to offering credit terms to foreign B2B customers than to domestic B2B customers. In 2017, respondents in Hungary (65.5%), Czech Republic (43.0%) and Turkey (38.1%) were the most open to selling on credit. In contrast, respondents in Poland (28.9%) had the lowest average percentage of sales made on credit terms. Eastern European respondents (40.3%) seem slightly more inclined to sell on credit than their peers in Western Europe, where 38.8% of the total value of B2B sales was transacted on credit. 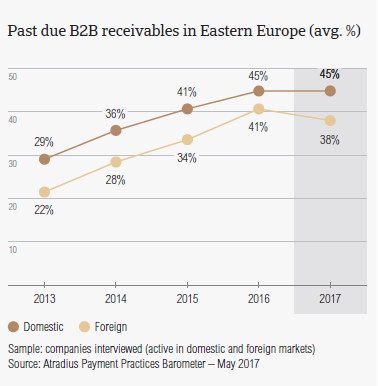 After an increase of almost five percentage points in 2016 (42.9%), the percentage of overdue B2B invoices in Eastern Europe decreased again this year (41.5%). 88.5% of respondents in Eastern Europe (2016: 88.6%) reported late payments from their domestic B2B customers. Just under half of the domestic invoices, an average of 45.2%, remained unpaid at the due date. The frequency of late payments from foreign B2B customers decreased from 81.8% in 2016 to 78.9% this year. On average, 37.7% of foreign invoices remained unpaid at the due date. In Eastern Europe, respondents in the Czech Republic were the most likely to experience late payments (domestic 95.1%, foreign 84.8%) and respondents in Hungary the least likely (domestic 75.2%, foreign 57.8%). Despite minor improvements registered in 2017, Turkey seems to be the country most impacted by late payments of invoices; 60.9% of the total value of domestic and 50.9% of foreign invoices were paid late. This is also reflected in the country’s DSO figure, which averaged 73 days and is significantly higher than the average for Eastern Europe (61 days). The percentage of overdue B2B invoices is higher in Eastern Europe (42.9%) than in Western Europe (41%). In 2017, B2B customers of respondents in Eastern Europe enjoyed longer average payment terms. Despite this, payment delays by domestic B2B customers increased in Hungary, Turkey and Poland. Poland also reported more payment delays by foreign B2B customers. In 2017, payment terms granted by respondents in Eastern Europe averaged 35 days, four days longer than in 2016. With the exception of Turkey (47 days) and Slovakia (36 days), all Eastern European countries surveyed granted payment terms under the regional average. Turkey has seen the biggest changes. The average payment terms extended by nine days. Three of the five Eastern European countries surveyed, Hungary, Turkey and Poland have seen an increase in domestic payment delays. A slowdown in domestic payments was also observed in Western Europe. 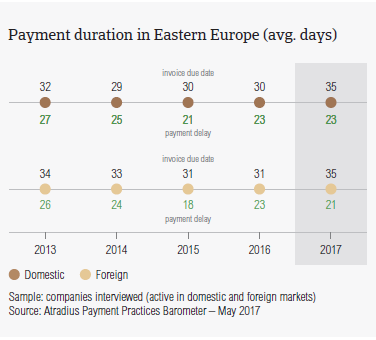 With the exception of Poland, respondents in Eastern Europe reported fewer payment delays by their foreign B2B customers in 2017. Based on the above-mentioned changes, respondents in Hungary have the shortest invoice to cash turnaround (around 21 days), while respondents in Turkey take the longest (on average, 42 days). Similar to their peers in Western Europe, B2B customers of respondents in Eastern Europe delayed their payments most often because of liquidity issues. B2B customers of respondents in Eastern Europe delayed payments most often due to insufficient availability of funds (46.0%), their buyers’ intentional use of outstanding invoices as a form of financing (30.0%) and the complexity of the payment procedure (19.5%). Hungary (75.7%) and Poland (63.1%) are the countries most impacted by late payments due to domestic customers’ insufficient funds. Foreign payment delays driven by liquidity issues were reported most often in Hungary (52.8%) and Slovakia (50.0%). Czech respondents experienced delays because of insufficient availability of funds the least often (domestic 41.8%, foreign 18.5%). However, they were the most concerned about their buyers’ use of outstanding invoices as a form of financing (domestic 47.7%, foreign 34.0%). The complexity of the payment procedure is one of the most frequent payment delay factors reported by respondents in Turkey (domestic: 34.1%, foreign: 20.7%). 13% of respondents in Eastern Europe plan to do more to protect their businesses from the impact of Brexit, the slowdown in Asia and US protectionism. This is a lower percentage than in Western Europe (18%) and may highlight Eastern European respondents’ perception that due to the volume of trade transacted with these markets they are not exposed as much to the risks arising from these developments. 53.3% of respondents in Eastern Europe reported they will continue using their current mix of credit management tools. On average, 16.4% of respondents reported their intention to increase checks on buyers’ creditworthiness and 15.8% to increase monitoring of buyers’ credit risk in the face of the above-mentioned developments. These were also the two credit management tools most reported in Western Europe, although the percentages were significantly higher (23.5% and 19.0% respectively). There appears to be a comparable perception of the risk of payment default stemming from Brexit, US protectionism and Asia’s slowdown and in the ways to protect against them. Respondents in Eastern Europe seem to opt for the same management tools to protect themselves against Brexit (increasing creditworthiness checks: 16.6%; increasing credit risk monitoring: 15.9%), the slowdown in Asia (increasing creditworthiness checks: 15.1%; increasing credit risk monitoring: 15.6%) and US protectionism (increasing creditworthiness checks: 17.4%; increasing credit risk monitoring: 15.9%). The proportion of B2B receivables reported by Eastern European respondents as uncollectable is 1%, slightly under the level reported in 2016 (1.2%) and under the Western European average of 1.3%. Domestic receivables were written off as uncollectable slightly more often than foreign ones (domestic: 0.8%; foreign: 0.2%). However, with the exception of Turkey, the average percentage of uncollectable domestic receivables was around 1% or less in all countries. In Turkey, the proportion of uncollectable receivables (2.2%) was significantly higher than the regional average and showed no changes compared to 2016. Uncollectable domestic receivables in Eastern Europe originated most often in the construction, consumer durables, and business services sectors. 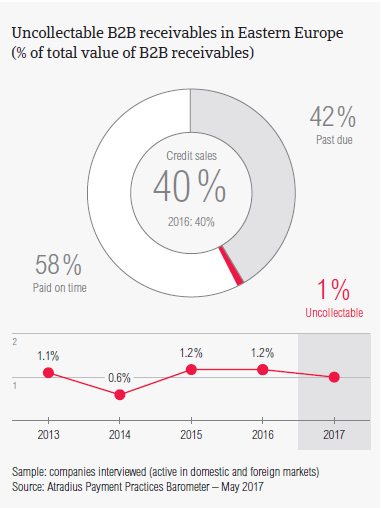 B2B receivables were reported to be uncollectable mainly because the customer went bankrupt or out of business (55.8%, slightly up from 54.7% in 2016). Respondents reported that write-offs were also due to one or more of the following reasons: failure of collection attempts (29.3%), and the inability to locate the customer (24.4%). Sharing the view of their peers in Western Europe, more Eastern European respondents expect an overall deterioration in the payment behaviour of their B2B customers over the coming 12 months. Respondents in Eastern Europe extended the most lenient payment terms to B2B customers in the metals (46 days from the invoice date), consumer durables (40 days) and transport sector (40 days). The shortest payment terms were granted to B2B customers in the services sector (27 days). 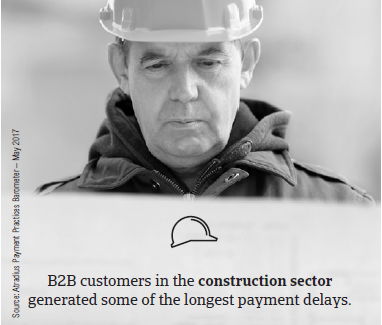 Despite being offered payment terms that are longer than the regional average (35 days), the construction and construction materials sectors generated some of the longest delays. B2B customers in these sectors, paid on average after 39 and 41 days respectively. The most frequently cited reason for late payment of invoices was insufficient availability of funds reported by 54.0% of respondents in the construction sector and by 52.0% of respondents in construction materials. Customers’ intentional use of outstanding invoices for financial advantage was the second most cited reason for delays (construction: 39.0%; construction materials: 31.0%). Most respondents in Eastern Europe (58.0%) don’t expect changes in the payment behaviour of their B2B customers over the next 12 months. Of those expecting a change, more respondents (26%) are expecting deterioration than improvement (16%). Given the positive economic outlook for 2017 with household consumption forecast to increase above 3% , robust consumer durables sales growth is expected.